The Lobular Breast Cancer Alliance (LBCA) is a volunteer-based national network of patient-advocates working with breast cancer researchers and clinicians. LBCA was launched in January 2017 by patient advocates who attended the First International Lobular Breast Cancer Symposium in September, 2016. 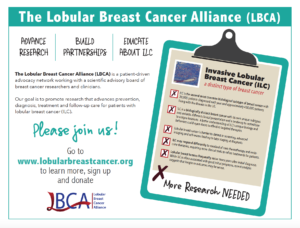 LBCA’s mission is to bridge patients, clinicians and researchers to increase our knowledge of lobular breast disease and promote research that leads to advances in prevention, diagnosis, treatment and patient follow-up care. LBCA welcomes patients with ILC, the clinicians who treat us and the researchers who are working to find cures, prevent our disease and refine treatments. The goal of this website is to create an online source of information and educational resources about lobular breast cancer, and to share how patients, clinicians and researchers can work together to promote and advance ILC research. As the LBCA continues to grow and develop, we will add content to this site. Please subscribe to receive periodic News and Updates by email and learn about new resources and opportunities. Thank you for joining us! We hope that by working together, we can elevate lobular breast cancer and advance research to improve outcomes for patients diagnosed with this disease. Download a one-page handout about LBCA to share.